» How are they used? Read through all the questions once. Don’t spend too long thinking about them, just familiarise yourself with the sorts of information they are asking of you. Read through them again, this time sorting into three piles: easy, hard, and need to think. Pick one from each pile in turn, scribbling thoughts and making notes of what your initial response would be. Keep scribbling until you’ve covered all of the questions. Some will be easier than others, remember this is initial thoughts, you don’t have to have exam standard answers at this stage. Over the next couple of weeks return to the cards when you have time. Expand your answers, identify references or key arguments to back up your point. Revisit the questions you are struggling with regularly, don’t avoid them. If you need help contact your supervisor(s) and ask for their thoughts, or discuss with a friend or colleague. Most importantly remember that you are the expert on your work; you’ve spent years preparing for this moment. The cards are designed as a tool to help you practice getting your comprehensive knowledge into concise and considered responses. It is perfectly acceptable to be honest and say when something did not work in your viva, but your examiners are likely to want examples and reasons for that. There is of course no requirement for the pack to be used in its entirety. You may find that some of the questions are much easier for you to answer than others; you can choose how to address that, you might like to display the cards you are confident about somewhere prominent, and keep the ones you need to keep thinking about with you. It should boost your confidence as the viva approaches to see more and more on display. 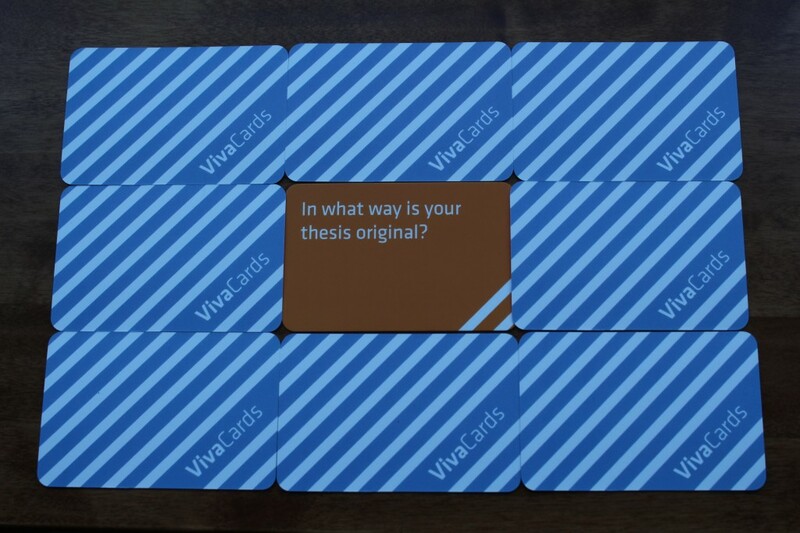 Remember the cards are only a starter for ten, you should talk to your supervisor about your own research and viva preparations. Perhaps you could take the cards to a supervision and use them as a prompt for a conversation about areas you are feeling less confident about. Alternatively, once you’ve familiarised yourself with the questions, and are growing in confidence answering questions about your thesis, you could use them like flash cards and test yourself for ten minutes each morning or evening. We’re interested in hearing your ideas for how you use them, so please do contact us and let us know how you get along.